While we were in Vancouver, Connie started to really move herself. 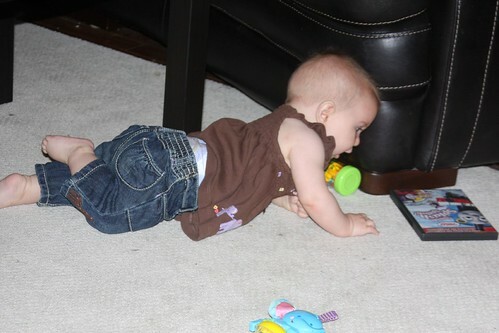 She had been able to go very short distances (< 2 feet) prior to our trip but she suddenly realized that this crawling thing could be a good way to get around. Notice her far arm is flat on the floor, that arm is used to pull her along the floor (it stays in that position). The other arm does some pulling as well. One foot is used to push her along. The other foot is for stability only. Despite the less than conventional method, she is quite fast and can easy go across and entire room. As you would expect, Connie is thrilled with her new abilities. Dougie, on the other hand, is not as thrilled. Suddenly, all his toys are “up for grabs.” He’s started putting them on tables, I don’t have the heart to tell him that won’t work for long either.